The food crops and cash crops grown the world over are mostly grown in open fields, but there’s a tiny five percent that are grown under controlled and predictable conditions, precisely for the purpose of a harvest that can be more accurately estimated. And this is made possible through the use of greenhouse technology. In short, green house technology is a technique of providing favourable environmental conditions to plants by growing them a greenhouse, a structure with walls and roof made mainly of transparent material, such as glass. These structures could range in size from small sheds to industrial-sized buildings. Exposed to sunlight, the greenhouse becomes significantly warmer than the external ambient temperature, protecting its crops from extreme weather – not only wind and temperature but also precipitation and pests. In this way, a greenhouse creates an ideal microclimate around the plants that support their optimal growth. The temperature and humidity within are regulated through ventilation. Thus, overall, greenhouses allow for much greater control over the growing environment of plants. There are several advantages to utilizing greenhouse technology. For example, crops grown under such controlled conditions provide a yield that is 7 to 12 times higher than crops grown in the open. Besides the fact that quantity of produce can be better estimated, it also provides for year-round and off-season production. Moreover, this technology helps produce disease-free and genetically superior transplants. It also aids the efficient use of chemicals and pesticides to control pests and diseases. Water requirement is limited and easy to control. All these advantages have ensured that more than 50 countries have jumped on the bandwagon of greenhouse farming, taking it up on a commercial scale. However, the design of greenhouses and the total area under cultivation are variable, depending on local conditions. Taking a look at world statistics in greenhouse farming, the United States has a total area of 4000 ha under greenhouses, used mostly for floriculture with a turnover of more than 2.8 billion per annum. In Italy and Spain, greenhouses are mainly being used for growing vegetables like capsicum, beans, tomatoes, strawberries and watermelons. Greenhouse Methods: These greenhouses use simple, tunnel shaped structures with polyethylene film as cladding, cutting out any elaborate environmental control equipment. In Canada, greenhouses are used both for flower cultivation and off-season vegetable cultivation. The vegetables typically include tomatoes, cucumbers and capsicum. When it comes to greenhouse-grown flowers, the Netherlands stands at the top as the traditional exporter of greenhouse-grown flowers and vegetables. The Netherlands is also the country with the most advanced greenhouse industry in the world and also upholds a strong R & D component. In the Gulf countries, greenhouses are developed to help grow crops under extreme climatic conditions. Israel is the largest exporter of cut flowers and has a wide range of crops under greenhouses. Even Turkey has an area of 10,000 ha under cover for cultivation of cut flowers and vegetables. 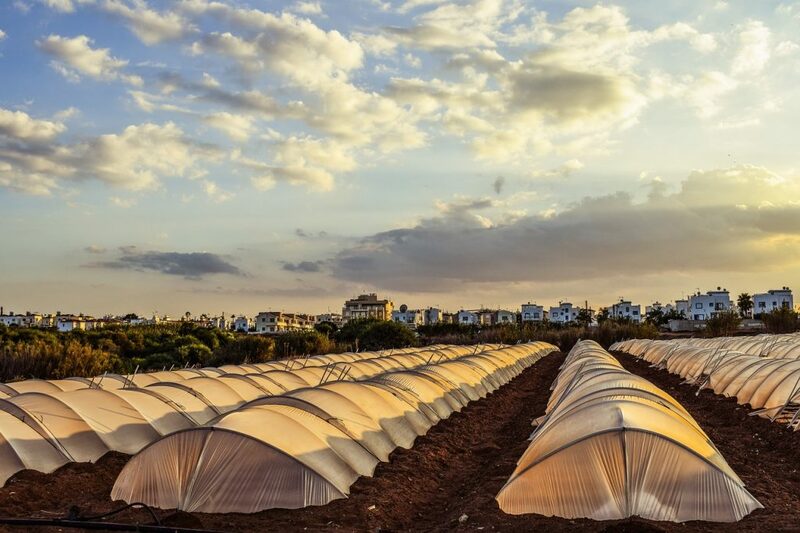 Egypt has about 1000 ha greenhouses consisting mainly of plastic covered tunnel type structures. In Asia, Japan and China are the largest users of greenhouses. The pace of development of greenhouse technology has been faster in China than anywhere else in the world. Japan has more than 40,000 ha under greenhouses out of which nearly 7500 ha is devoted only to fruit orchards. South Korea too has more than 21,000 ha. Thus we can see how greenhouses permit crop production in areas where winters are severe and extremely cold as in Canada and USSR, and also permit production even in areas in which summers are extremely intolerable as in Israel, Kuwait and the UAE. Greenhouses in Philippines make it possible to grow crops in spite of excessive rains and also in moderate climates. The greenhouse industry set off with a modest beginning almost half a century ago, although as an idea it had existed since Roman times. Greenhouses in which the temperatures could be manually manipulated first appeared in 15th century Korea. It later appeared in the Netherlands and then England in the 17th century. Experimentation with the design of greenhouses continued during the 17th century in Europe, as technology produced better glass and construction techniques improved. The greenhouse at the Palace of Versailles was as example of their size and elaborateness. Its golden era was in Victorian England where the largest glasshouses yet were conceived. From being a concept that is fancy or a structure that is elaborate and that adorns palaces and gardens in classical Europe, in the present day, it is also aiding farmers out of poverty. A start-up called Kheyti in Telangana, India, recently won the global social venture competition. Kheyti produces and markets ‘greenhouse in a box’ – a simple, low-cost greenhouse that can sit on a small area of farm. This has enabled the farmers to grow regular crops, which guarantees them year-round income even if everything else goes wrong. These are farmers for whom income variability is the biggest problem, with only two harvests a year. This income too is under attack by various environmental factors, including unseasonal rain and pest attack. These destroy the crop time and again, and keep farmers stuck in the poverty cycle. The typical greenhouse available in India was originally designed for farmers in developed countries who grow high value flowers or vegetables – well out of the price range of a low income farmer. The new greenhouse is simpler, with fewer materials and a smaller footprint that’s roughly half the size of a basket-ball court or 2% of the land area of a typical farm in India. The layers of shade netting on the top reduce the temperature inside by 5-8 degree C. Insect netting on all sides reduces pest attack by 90%. A profitable harvest, of course, needs more than a greenhouse. A drip irrigation system, coupled with shade that reduces heat and evaporation, helps cut water usage by 90%. They also need access to right seeds and fertilizers to be used inside, and the right training needed to manage any disease. Since a greenhouse can protect crops from floods and pests, the farmers are able to grow seven times more produce. All this goes to show that a greenhouse is a worthwhile investment that can stabilize both environmental conditions and generate income through the year.